UH West Oʻahu will conduct an active threat drill on Friday morning, Nov. 13. The campus will practice its response and lockdown procedures during the exercise that will last approximately 20 minutes. 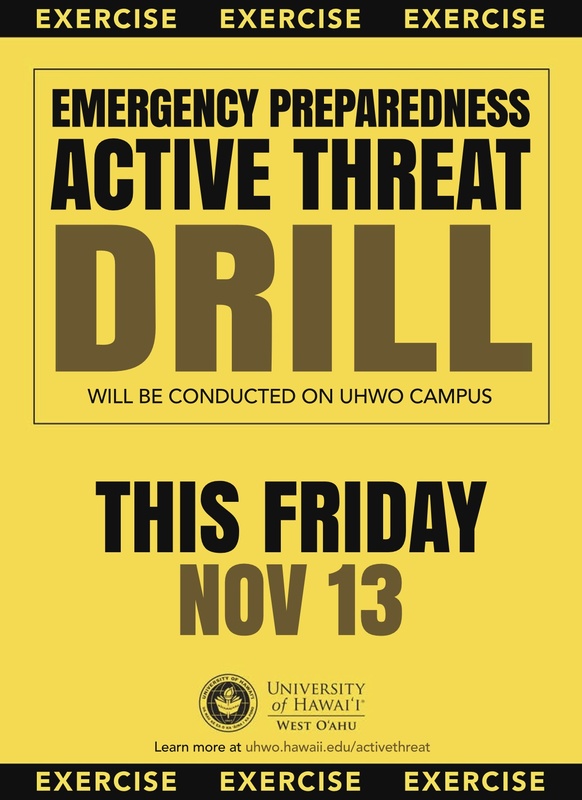 All UHWO students, faculty and staff on campus at the time of the drill are expected to participate and practice lockdown procedures. The Honolulu Police Department, Honolulu Fire Department and Emergency Medical Services will work together with UH West Oʻahu staff to ensure the drill meets active threat response protocols for the University and first responders. UH West Oʻahu offered active threat emergency preparedness training sessions the week of Nov. 3-6 highlighting suggested options for active threat response. Response guidance may be found on the UHWO website emergency page. If you or someone you know may experience adverse effects from the active threat drill, accommodations will be made. Please direct any questions or concerns to Tavia Oshiro at tavias@hawaii.edu. All UHWO affiliates are encouraged to sign up for the UH Alert text messaging system to receive emergency communication related to campus health and safety. Tagged active threat drill, emergency, emergency preparedness. Bookmark the permalink.